​The Quality Improvement System represents one of the most comprehensive quality improvement efforts in the out-of school time (OST) field. It supports Cambridge OST programs and organizations from within through leadership coaching and self-assessment processes, while building support across the OST professional community through peer leadership, mutual learning, and sharing of challenges and promising practices. OST programs in Cambridge are paired with Quality Coaches to support and guide them through the Quality Improvement System. 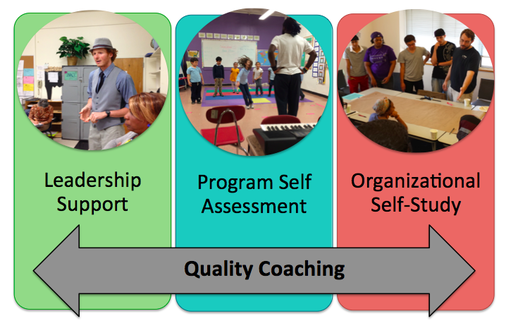 Coaches model and teach the practices of the self assessment cycle to program leaders, helping them to identify program strengths, implement facilitative leadership, and improve program quality from within. Quality Coaching provides support to leaders at the executive and program levels. The Agenda for Children utilizes the National Institute on Out of School Time's (NIOST) Assessment of Program Practices Tool (APT) for program-level observations. These standards develop a common language for discussing quality in three central areas: Quality of Activities, Positive Behavior Guidance, and Staff-Youth Relationships. Research shows that strong program practices in these three areas lead to positive outcomes for youth. Our model engages members at every level of the organization in the observation process, guided by a Quality Coach over multiple years. Staff at all levels of participating programs complete a 21-item organizational health study developed by the Agenda for Children. The Organizational Self-Study (OSS) helps sites better understand how they function as an organization, how they think about and work towards quality, and how they build a solid foundation on which they can continuously build. The OSS helps programs look at the bigger picture of organizational health in order to support quality on the ground. The OST programs involved in the Quality Improvement System serve children and youth all around the city of Cambridge. Our participants represent all forms of OST programs serving young people from pre-K to 12th grade. There is no cost to programs to participate in the Quality Improvement System. Programs do, however, commit significant staff time for meetings, observations, training, and coaching. If you are interested in joining the Quality Improvement System or have questions, please contact Cambridge Agenda for Children Out-of-School Time Co-Director Susan Richards.